Had one of Tomorrowland's flying saucers gone missing? When the Anaheim Convention Center's arena opened in the summer of 1967, it looked as if a spacecraft from another world had touched down directly opposite Katella Avenue from Disneyland. Designed by Los Angeles-based architects Adrian Wilson and Associates, the Space Age, Googie-style arena cut a striking figure. Two 200-ton steel arches held up its concrete shell dome. When viewed from the proper angle, the arches seemed to spell out the letter "A." Inside, project architect Craig Bullock boasted, the circular arrangement of the auditorium around an elliptical floor plan provided more intimate views from the 9,100 olive green, tan, and orange plastic seats. In its early years, the multipurpose arena hosted circuses, a Richard Nixon political rally, boxing matches, and numerous musical performances. Days after the convention center's formal dedication on July 12, 1967, The Doors played to a capacity crowd under the arena's concrete shell. Months later, the Anaheim Amigos of the newly formed American Basketball Association moved in for their debut season, which turned out to also be their last, as average crowds of 500 forced the team to relocate the next year to Los Angeles. Though the futuristic arena was what first caught the eye, the new convention center — built at a cost of $8.5 million and financed by a four-percent room occupancy tax — boasted several other features that long made it one of the West Coast's premier event spaces. Proximity to the Magic Kingdom was one. It also offered a massive, 100,000-square-foot exhibition hall, ample parking, and the largest door of any public facility in California. At 40 feet wide and 25 feet tall, the portal could accommodate boats and other super-sized objects that would be left outside at other convention venues. 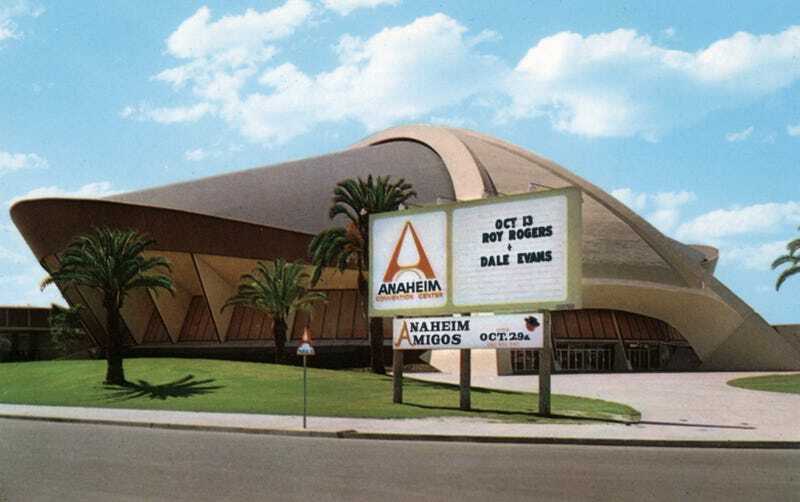 In the decades since its 1967 opening, several major expansions have transformed the surrounding convention center, and in 1993 the much larger Anaheim Arena (today, the Honda Center) opened down Katella Avenue. But despite these changes, the arena remains an Orange County landmark and a conspicuous relic of the Southland's onetime fondness for Googie-style architecture. Top image: An early color photo of the Anaheim Convention Center's arena, courtesy of the Orange County Archives. An aerial view of the Anaheim Convention Center under construction in 1966. $1.3 million worth of Bethlehem Steel went into the complex. Courtesy of the Anaheim Public Library's Anaheim History Room. The arena around the time of its completion in 1967. Courtesy of the Anaheim Public Library's Anaheim History Room. The Doors and Jefferson Airplane were among the first musical acts to play inside the arena. Courtesy of the Anaheim Public Library's Anaheim History Room. The Anaheim Convention Center arena in 1975. Courtesy of the Herald-Examiner Collection - Los Angeles Public Library. Before the construction of Disney's California Adventure, the arena was a conspicuous sight from the Disneyland parking lot. Courtesy of the Orange County Archives. Southland is made possible by a partnership among Gizmodo, the USC Libraries, and the member collections of L.A. as Subject. Written by Nathan Masters, the series explores the urban past of Los Angeles, including the lost landscapes and forgotten infrastructures that continue to influence the city we know today. This post originally appeared on KCET.org.